The project was a partnership between CABI, the University of Nebraska Lincoln and National and agricultural research and extension systems in 13 countries in sub-Saharan Africa. 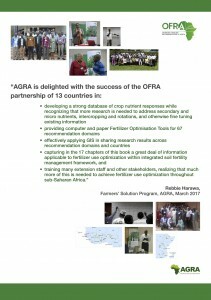 OFRA was supported by the Alliance for a Green Revolution in Africa (AGRA). The aim of the project is to contribute to improved efficiency and profitability of fertilizer use within the context of integrated soil fertility management (ISFM) practices. The project was managed by George Oduor, from CABI. Professor Charles Wortmann of the University of Nebraska Lincoln (the OFRA science coordinator) led on the research effort and ensures the efficacy of the science. More information on OFRA team and the roles they carried out can be found on the ASHC/OFRA team page. 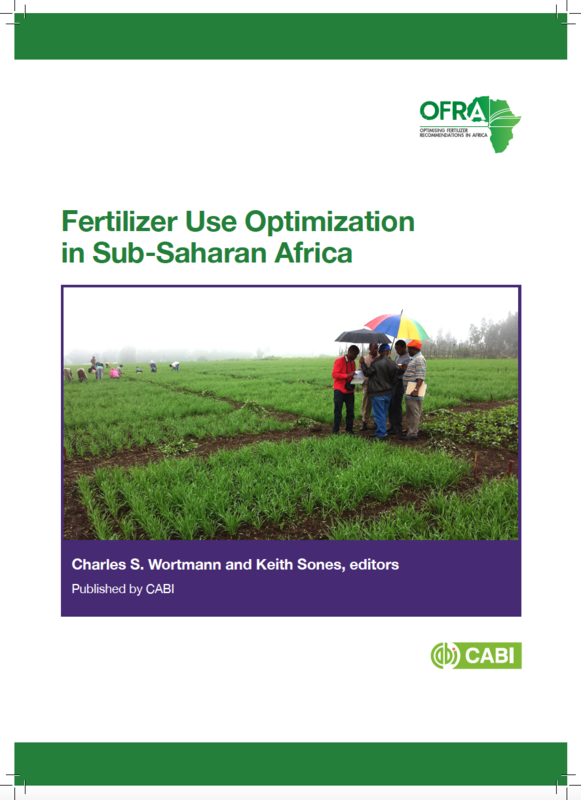 In March 2017 the project published a 228 page book Fertilizer Use Optimization in Sub-Saharan Africa to share the findings of the OFRA project. The publication is free to download from the ISFM materials library developed by the Africa Soil Health Consortium. OFRA worked in Burkina Faso (l’institut de l’environnement et de recherches agricole), Ethiopia (Ethiopian Institute of Agricultural Research), Ghana (Soil Research Institute), Kenya (Kenya Agricultural & Livestock Research Institute), Malawi (Department of Agricultural Research Services, Ministry of Agriculture and Food Security), Mali (Institut d’Economie Rurale), Mozambique (National Agricultural Research Institute), Niger (Institut National de Recherche Agronomique du Niger), Nigeria (Institute for Agricultural Research) , Rwanda (Rwanda Agriculture Board), Tanzania (Mlingano Agricultural Research Institute), Uganda (National Agricultural Research Laboratories) and Zambia (Zambia Agricultural Research Institute). National agricultural research and extension systems conducted field research on the main food crops which included maize, sorghum, pearl and finger millet, teff, rice, cassava, beans, groundnuts, soybean, pigeonpea, and cowpea across a range of agro-ecological zones. Data from relevant past research was collated together with findings from on-going research trials in a common database. This data was used to develop fertilizer guidelines, that maximise profitability of fertilizer use, within an ISFM framework. This database is managed by Martin Macharia at CABI. The data collected was used to develop practical decision support tools including fertiliser optimisation tools. The fertilizer optimisation tools provide advice on how much fertiliser a farmer should use to maximise their profits, tailored to their individual situation. 74 computer-based fertilizer optimisation tools, or FOT, (running on Excel) and paper-based tools have been developed by the national research teams supported by University of Nebraska-Lincoln. The paper-based tools do not have the interactive of the Excel tool, instead they rely on three levels of financial investment. These tools cover 66 discrete agro-ecological zones. The team at CABI, supported by an Oxford-based company called White October are working on the development of an app for android devises such as smart phones or tablets to make the FOT more readily available in Africa. 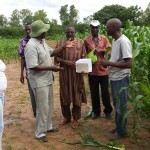 OFRA worked closely with the Africa Soil Health Consortium (ASHC), another CABI-lead project that is disseminating information on integrated soil fertility management in sub-Saharan Africa. ASHC worked with partners in the OFRA project to package information and knowledge emerging from project experience for diverse audiences including, small holder farmers, and extension and policy makers. A new 228 page book Fertilizer Use Optimization in Sub-Saharan Africa has been published by CABI to share the findings of the OFRA project. The publication is free to download. Communication materials for training and extension were developed in participatory way to build capacity of partners and local stakeholders in the process. Harrison Rware leads on monitoring and evaluation in the project. 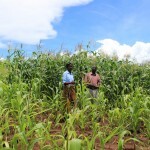 10 December 2018 blog Fertilizer Optimization Tool pays dividends for farmers in Uganda A decision support tool that allows an extension agent to take into account a number of the farmers’ circumstances and investment goals to maximize the benefits of fertilizer use on their farms is starting to pay dividends in Molo Sub-County in Uganda – with some farmers reporting a seven-fold increase in yields. 23 July 2018 blog Smarter fertilizer recommendations Between 2013 and 2017 CABI, University of Nebraska-Lincoln (UNL) and 13 national agricultural research and extension systems (NARES) formed a consortium that explored new ways of delivering smart fertilizer recommendations. 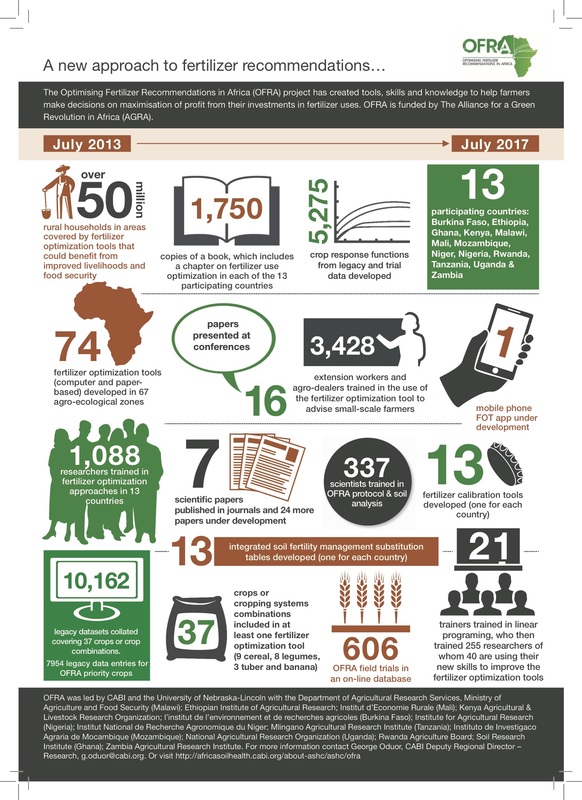 05 July 2017 blog OFRA and the fertilizer data legacy… Following the recent close-out workshop of OFRA we asked Martin Macharia, the projects data manager at CABI, to talk us through the achievement of objective 1 to improve use of research data to support fertilizer recommendations. 14 June 2017 news Fertilizer approach could empower 50m African families Four years of dedicated work by scientists in 13 African countries has resulted in the creation of innovative tools to help farmers maximise their profits from investments in fertilizers. The Fertilizer Optimization Tools (FOTs) were created as part of the Optimizing Fertilizer Recommendations for Africa (OFRA) project, funded by AGRA, and coordinated by CABI and the University of Nebraska-Lincoln. 22 May 2017 news 1,000+ scientists trained in fertilizer optimization OFRA: The training session for scientists in Nigeria last week, means the Optimizing Fertilizer Recommendations for Africa (OFRA) team has trained more than 1,000 scientists from 13 countries in Eastern and Western Africa, on fertilizer optimization approach. 20 May 2017 news 2,450 Extension agents learn fertilizer optimization OFRA: More extension workers can now use the fertilizer optimization approach to advise farmers on more efficient and profitable use of fertilizer in sub-Saharan Africa as a result of the awareness raising and capacity building initiatives of the CABI-led Optimizing Fertilizer Recommendations in Africa (OFRA) project. 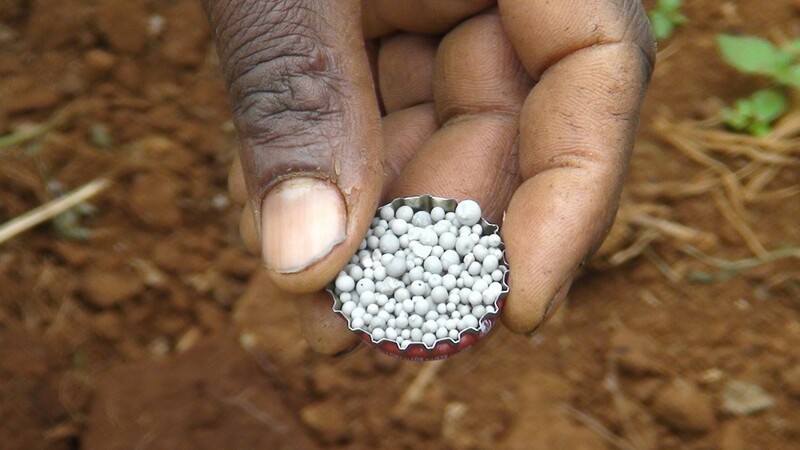 Optimizing Fertilizer Recommendations for Africa (OFRA) seeks to increase crop productivity, profitability, and food security in smallholder farming systems in Africa.